So I was sick last week. Just a stupid cold, but still! I hate being sick. Although, It's not as though anyone enjoys illness. I'm pretty sure I had a fever at one point, or at least I think I did. I don’t have a thermometer or anything. I am not a mom and I am not a doctor’s office… so I feel like that explains why I don’t have a thermometer. I do have a meat thermometer. Would that have worked? I mean, humans are technically meat right? I figured out I had a fever when Marina walked into the house wearing running shorts and I was on the couch in my puffy down coat with the hood up. The aches and chills could have tipped me off, but it took that special visual for it to sink in. The good news is that I am extra awesome and healthy now! 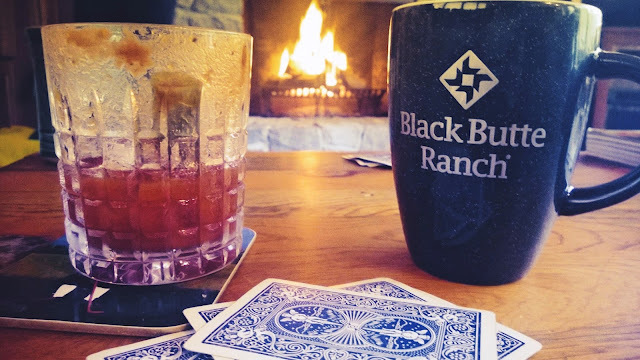 I also spent the weekend in Black Butte with a few of my lovely friends. A bloody, coffee and cards, the perfect medicine! Alright folks. Brian and I have an ongoing disagreement. It’s not so much a disagreement as it is a debate laced with him thinking I’m annoying. Can’t win em all! This drives Brian insane. He says, “It is just coffee!!! There is no 'a' in there!” I clearly disagree. If I am ordering a prissy drink like a 2 pump pumpkin spice Americano with room… that isn't coffee, it is a coffee drink. I feel sort of bad that it annoys him, since I don’t even know when I say it. Except that I don’t feel bad at all due to the fact that I’m right. Look! It's Brian with "A coffee." Can I get some input here? Am I a crazy person for saying “a coffee” when I am referring to Starbucks type coffee bevs? You can download some free Betty Who here! I am currently obsessed. Down with the Red Coats! Have you noticed how the news calls it Independence Day rather than the 4th of July? Do they have to? “Independence Day” is the official holiday title, so I guess they can’t get sloppy and casual and call it the 4th. So pretentious. I spent the most amazing weekend in Black Butte. [Read an old post about the ranch here!] What was so amazing you ask? Oh, just everything. I subjected Brian to my family… so let’s just say I was thinking the weekend had the potential to be a little dicey. He could be like, “whoa, what is up with these people?” Or maybe he would embrace us, including the weirdness that is inevitably in every family. I mean, it isn't like you know what is weird about your family. You are in too deep. The weird is normal for you! Don’t worry, it was great! The weekend was freaking awesome. 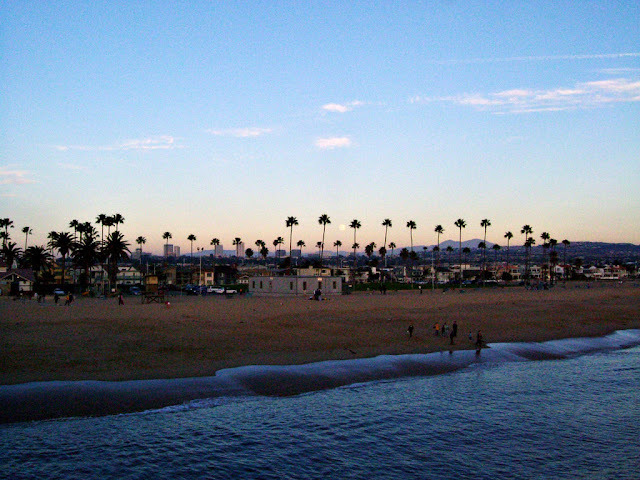 I spent so much time in the sun. Time walking on the golf course and laying by the pool! 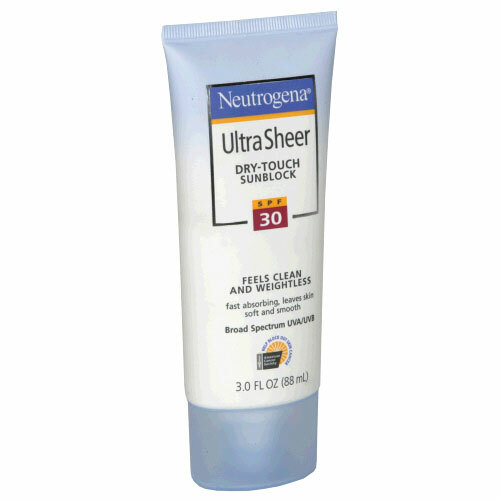 I think I am probably no longer 98% water, but instead 96% water and 2% sunscreen. (So I just researched this and the internet says we aren't 98% water. Umm. I’m pretty sure I learned that fact, turned myth, in science class. Great job public schools!) But seriously, it was a great weekend. The men and my mother golfed, my sister and I walked with them on the golf course and lounged by the pool… and we really did nothing else. Basically we ate, relaxed and sipped bevs for 4 days. What a great way to honor those who fought for our freedom! Okay, that is all. Linking up with Sami today for weekend shenanigans, 4th of July edition! Pardon, I meant Independence Day. I hope you all had great weekends! This weekend I wine tasted and it was fantastic! One of the major benefits of living where we do, is that we basically have our very own Napa Valley just a hop skip over in Yamhill County. Yes, it is a much chillier and really probably not like Napa Valley, but it is very beautiful none the less. And they have wine! So… yeah. It’s awesome. Know what else is awesome? The fact that I went to college out there! I would say that we all (speaking directly to my fellow wildcats) took for granted that our college was in such a beautiful place. At least I can say that we took advantage of the wineries for a couple years. Turning 21 in wine country was not so shabby! We started the day with brunch and mimosas, packed the car with snacks and hit the road! We visited Penner Ash, Adelsheim, Bergstrom and Colene Clemens. Our least favorite was Adelsheim. They were crazy pretentious and had pathetic pours. We paid to be in here! You might as well be nice and quit being so stingy with your vino! You have a few grape vines… I don’t think you’re going to run out! All the others were marvelous though. Amazing wines at Penner Ash, snacks and cool stories at Bergstrom and Colene Clemens had a pup and a fire place. Who doesn't love a cute puppy and cozy fireplace!? Get ready for a ridiculous amount of photos! Marina and my lovely mother! Mama Jo was our chauffeur extraordinaire! Just a few texts went out... Sorry I'm not sorry Brian! Pretty friends and tasty wine. This was the place w/ snacks! We were about it. I hope your weekends were stellar too! 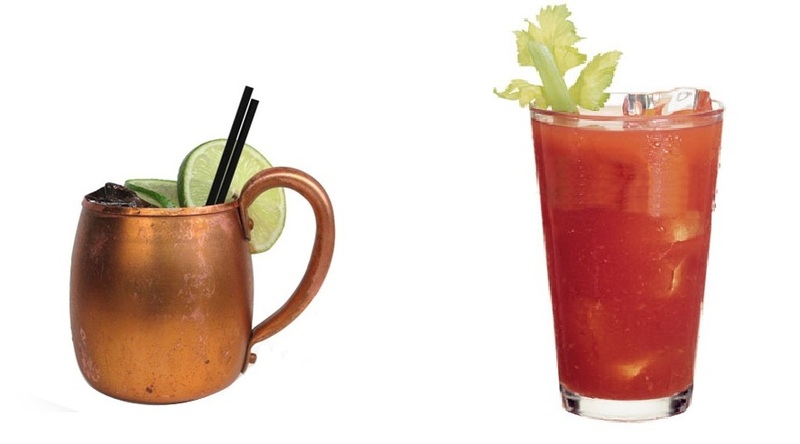 Best of the best: Bloody Mary Mix! 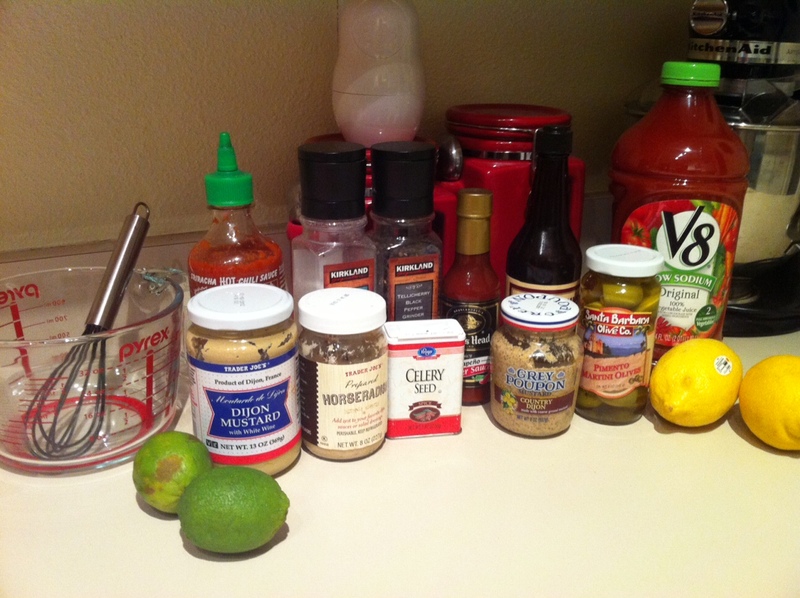 I have used a couple different recipes in the past. This time I took the best ideas from each. Now we have the best of the best! Mix all of the ingredients together. I go liquid first. It ends up being less messy that way. 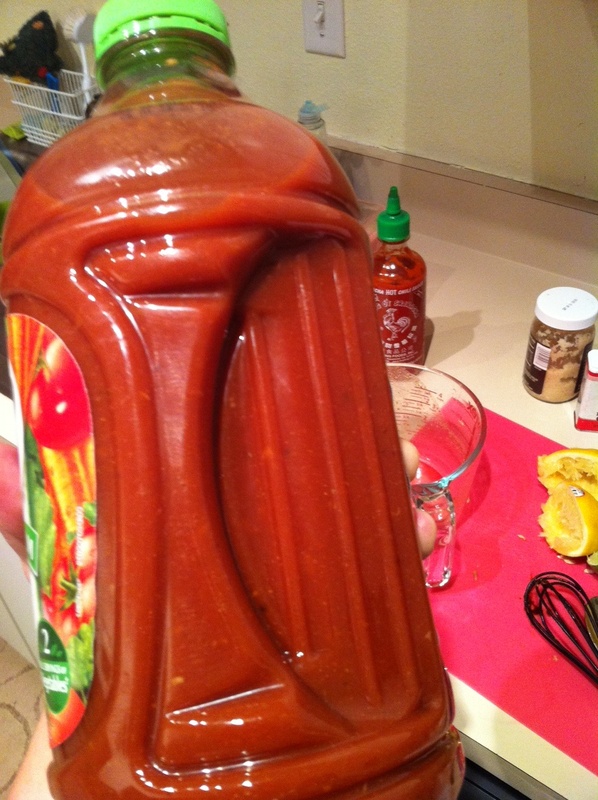 Once it is all whisked together, see how much there is and pour out that same amount from the Tomato juice jug. Now that there is spare room in the juice jug, pour the mix right into the jug and shake it up! Fill your glass with ice. Add vodka and mix! Garnish with a lemon slice and pickled veggies! The most important addition is the Sriracha sauce. You have the Tabasco for initial spice and the Sriracha gives you that after heat. I happened upon this by chance when I ran out of hot sauce once. 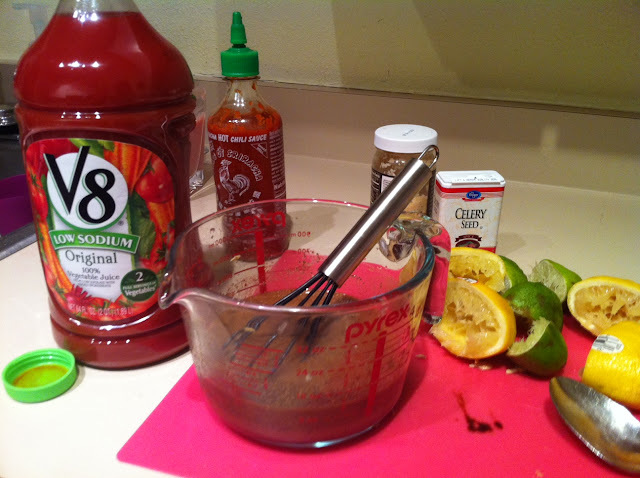 It was my replacement sauce and it is now my favorite thing about the mix! I swear it makes all the difference. Also, I read a lot of recipes that said to use tomato vegetable juice. It is thicker and more flavorful/ makes a better base for your mix. I always go with low sodium because you are adding so much salt from the other ingredients! Plus, always tryna prevent being bloated. Am I right!? Try it out and tell me you like it! If your response is negative just don't tell me. Slater! Get ready for another super lame post. I am just not motivated this week. I promise to do better soon. Well, as we all know, goals are very important. I make my cheerleaders set goals at every practice. I think we should all have daily goals, even if it is as lame as being a friendly driver. I try not to get too goal oriented when it comes to the big picture. I don't want to step out in front of God's plan. The second we do that he throws us for a loop anyway. All I can do is try to serve and give and set mini goals that will hopefully do some sort of good. Now it is time to be shallow. I have a new funny little goal. And by goal... I really mean wish. 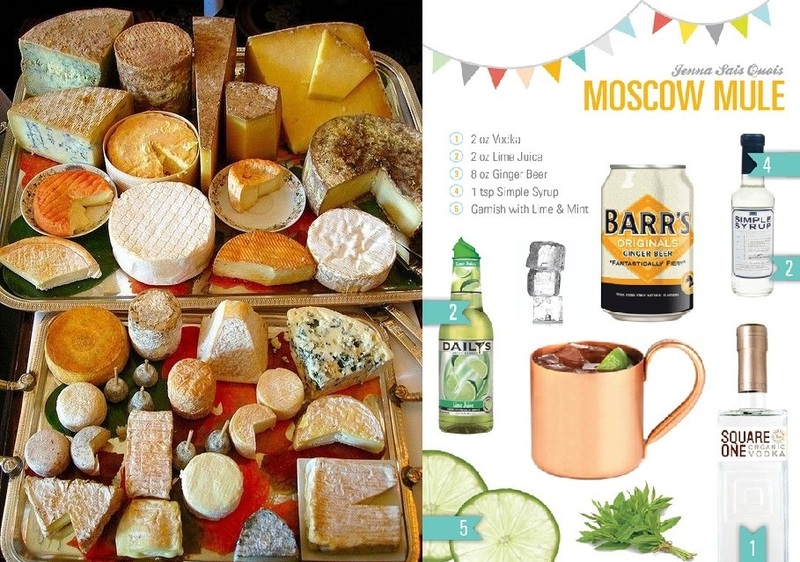 I would like to find a PDX restaurant or bar that has an insane cheese plate and a Moscow mule on their happy hour menu. Yes, I know this is silly. I also know that this would only be benefiting me... sometimes we are selfish. Get over it. I am aware that these items don’t really go together and that there are restaurants that offer both. BUT am looking specifically for a HH. From now on I will need to look for a comment card at all of the establishments that carry these delectable offerings. Uhhh... An apple a day? I am currently enjoying Tropical flavor mixed with OJ. Oh, did you want to hang out tonight? Can’t. 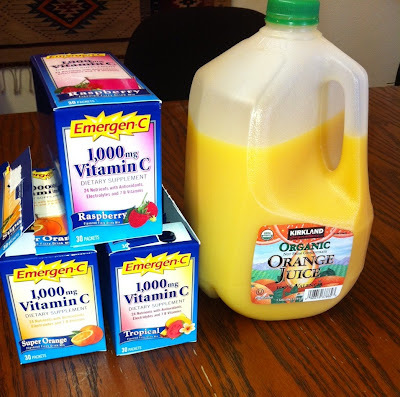 I am busy watching TV and slamming back Emergen-C.
Don’t feel too bad for me! Tonight’s broadcast has a lot to offer. We have Glee and New Girl! Booya! If you have not yet had the chance to see New Girl, I highly recommend it. ‘Tis Hilar. PS. Fact: Emergen-C tastes better when consumed from a mug. No, fools. I meant to change soup to sip! Anyway, “That sounds good, I’ll have that.” Get it? Dumb and Dumber? 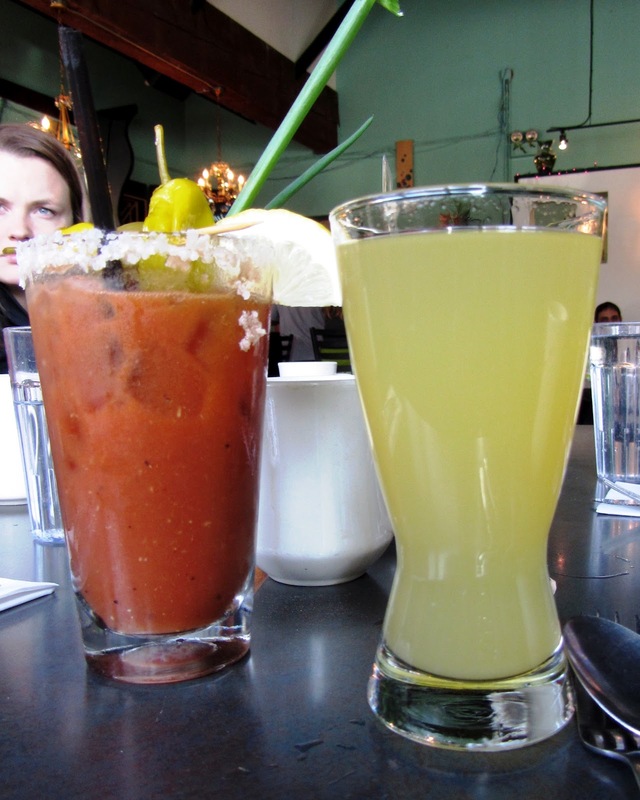 Sip instead of soup because this post is mostly about soda and coffee. 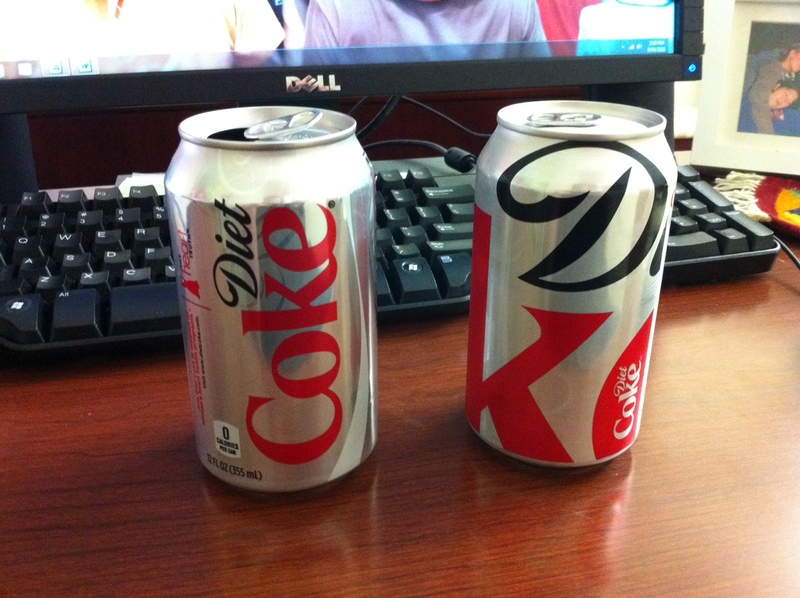 So I have been a long time drinker of Diet Coke. I affectionately call it DC. I love the stuff! It is dang delicious. Libby even recently mentioned how good we have been by not having it in our house! Little does she know that we have DC at work! Bahaha. I’m a cheater. Do I wish I didn’t drink it? Yes. Does it leave me feeling bloated and guilty? Yes. What do you guys think? I get where they are coming from. Making it all hipster and what not. I mean, I am pretty indifferent about what the can looks like. As long as they don’t change the recipe. Remember DC with Splenda!? That shiz was narsty. No wonder it was discontinued. Just thought I would share this recent discovery. I haven’t seen it anywhere else. Is the new can exclusively for Costco? Haha! Obvs not, but I figured this new branding would come with a stellar marketing campaign…. Hmmm. On a note related to yesterdays post. I thought I would let you guys know that I embraced Fall today. Apparently I have come far in the past 24hrs. It officially smelled like Fall this morning. It made me really miss walking to class on the Linfield campus. Ahh I can picture it now. Flats on, tumbler in hand, headed down the path that cuts through the quad toward O’Rileys, gotta hang a left and head toward Renshaw (also lovingly known as “The Shaw”). Making this journey with my mass comm. roommates was one of the highlights from Fall senior year. Apparently it is the really insignificant things that stick in your memory. Yes, today felt like Fall. To prove how I have embraced it, I will share a few of my September 14th, 2011 choices with you. I wore my leather jacket today. I even ordered a PSL from Starbucks! I should also mention that I was at Starbucks for 25 minutes this morning. They were understaffed and I felt really bad for them! BUT, as a consumer, I have a particular expectation when it comes to Starbucks coffee. When it takes that long for my drink to come up on the bar it is usually accompanied by a free drink ticket… I am not saying that we should expect things like this… BUT I am just saying that Starbucks has marketed themselves/ gained a certain reputation when it comes to the promptness of their baristas. Just sayin’. Okay, well super random post. Whatevs. Drink your DC or your latte and get over it. I am a psycho. I really am. I am about to admit a little bit of crazy right here. I take my medical insurance card with me EVERYWHERE. I am serious right now. I know this is totally bananas... but for as long as I have been going out to bars or to parties in college etc. (uh…errr… obvi post 21 only) I have been taking my medical insurance card with me. I mean, you never know! What if I need it!? What if I somehow drink too much? What if I get roofied? What if I have a dance-off and twist my ankle when I decide that it's time to bust out a back-handspring? (This one is actually quite likely). These are all totally plausible right!? Right. I agree. That is why I take my insurance card. I switch it to every clutch, wallet, wristlet, satchel, tote… okay, you get the idea. 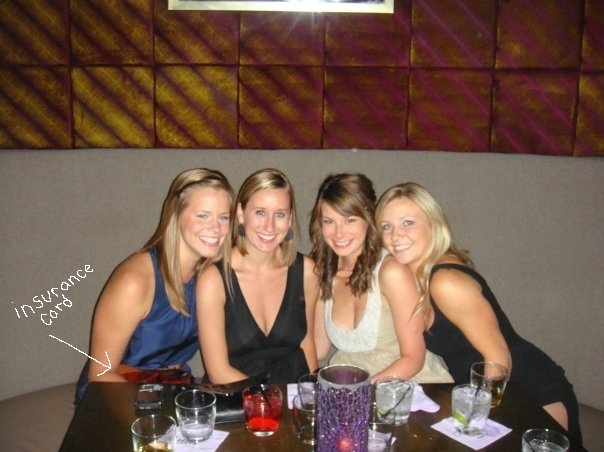 Out in Vegas circa 2009. See the eel skin clutch? Guess what was inside!? I encourage you to do the same. It's just good sense!